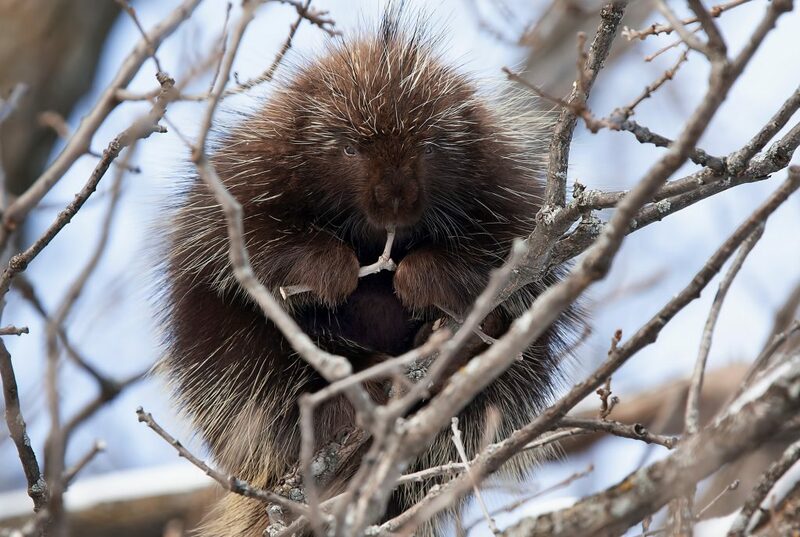 Wildlife abounds in the Yampa Valley, even in winter. 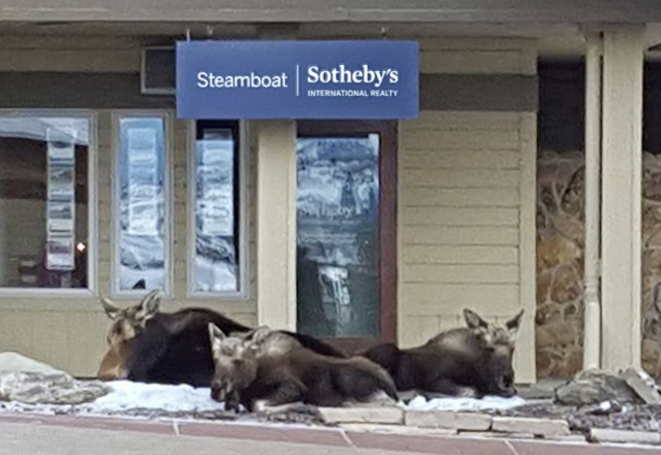 When you think about wildlife in Steamboat during winter, you might immediately think of moose. 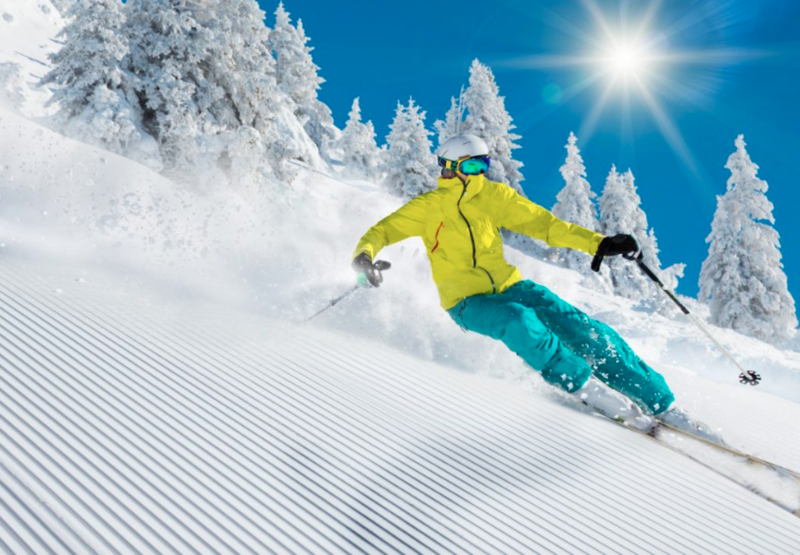 Maybe you’ve seen one walking near the ski resort or heard about a sighting. These massive, temperamental animals are no doubt an impressive sight, but a world of wildlife exists all around you, if you just know where to look for it. 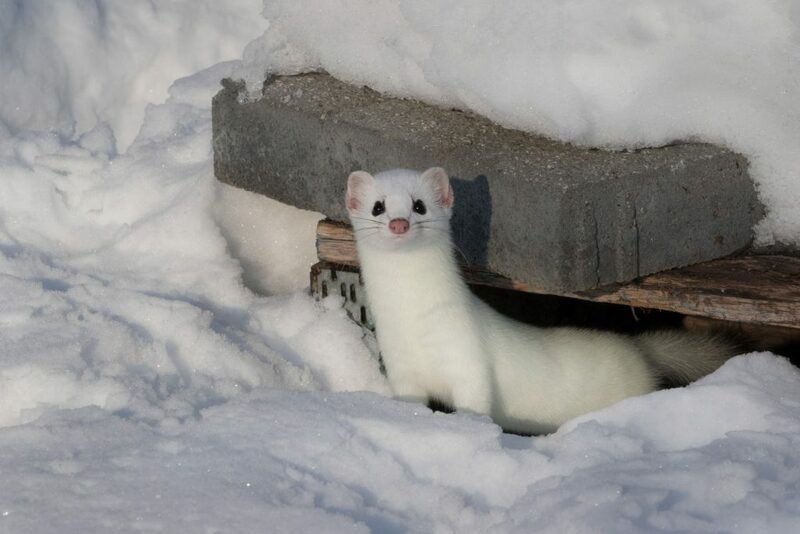 Yampatika’s Sam Rush says “stories in the snow” can be told more easily from all the animal tracks that become visible in wintertime. “You can get so much more aware and intimate with your surroundings by going out and walking, documenting tracks with your camera,” she says. Rush also recommends using a GPS or mapping app like iNaturalist on your phone to mark precise locations, especially if you come across a wounded animal or a scenario that might warrant contacting Colorado Parks and Wildlife. “At trailhead, take a photo of the trail map on the kiosk with your phone so you have an idea where you are,” she says. She also suggests carrying a track book or taking photos of tracks and then trying to identify them from a reference book when you get home, which can be a fun learning game for adults and their kids. We caught up with Sam for a rundown of animals—large and small—you might see in winter and how to better capture your own stories in the snow. “We do have a lot of birds who decide to stick around in winter, so if you put up a feeder be sure to keep it filled, especially during the coldest parts of winter.” Rush says there are many varieties of birds including mountain chickadee, black capped chickadees, downy woodpeckers, two nuthatch species, gray jays, and stellars jays. Rush notes that bluebirds and bats really help control the insect population since that is what they eat. “People with open areas on their property might want to consider putting up bluebird houses or bat houses in March and April.” She notes that the little brown bats in Colorado do not carry diseases and are often misunderstood. “I respect and appreciate the little brown bats because of the insects they eat,” she says. 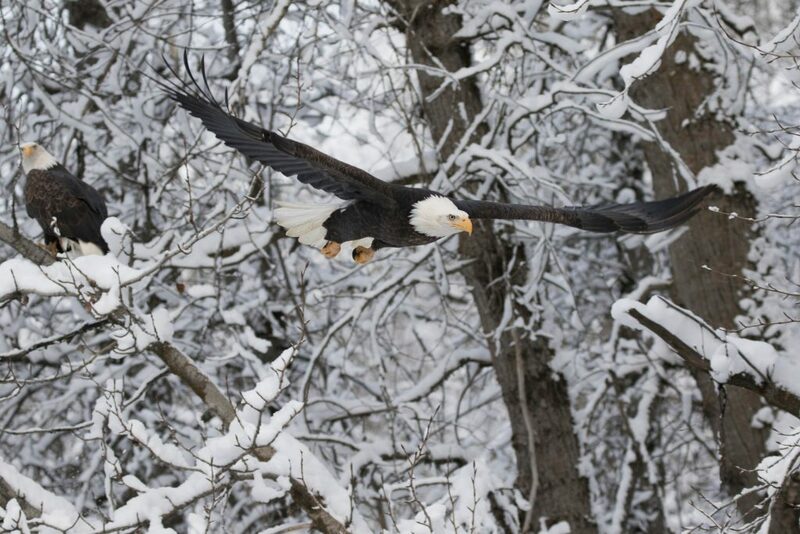 Bald eagles also stick around the Yampa Valley during winter, Rush says, and can be sighted in river corridors and open meadows where they’re going to be hunting fish, rodents, and “whatever they can get.” Rush says birds of prey share the same hunting ground so where there are bald eagles, you’ll probably also see osprey, who almost exclusively hunt fish. “When you see osprey dive in and use their talons to pull a heavy fish out of the water, it’s a pretty spectacular thing,” she says. 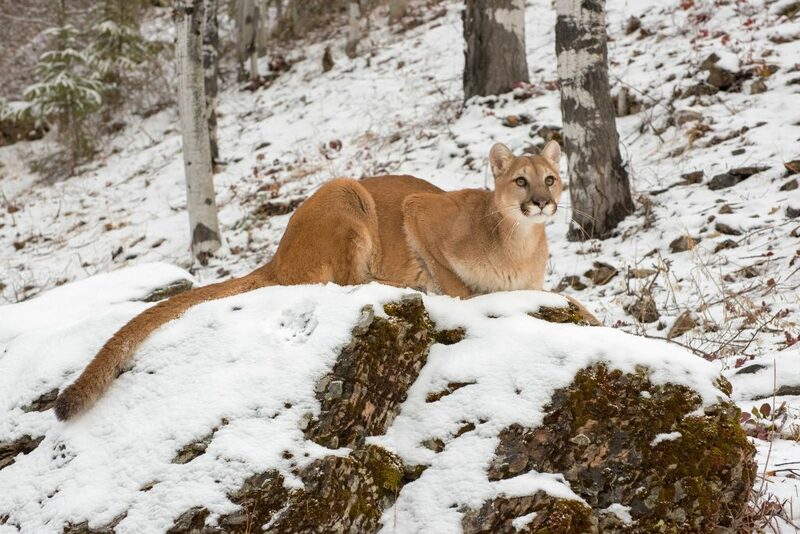 Mountain lions are crepuscular, which means they are out at dawn and dusk. 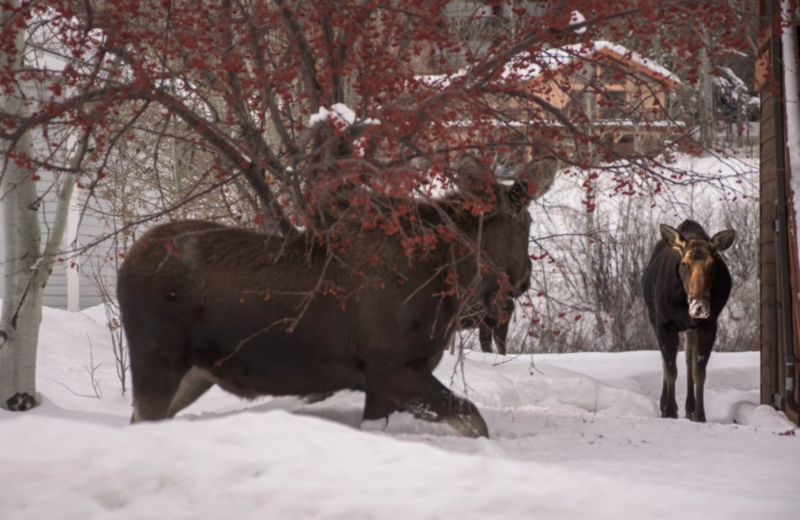 “If people want to see them moving and active the best time is when the sun is rising and setting.” Rush says they’re typically out hunting in winter and will hunt animals as large as elk. “One of the places mountain lions like to hang out is on sunny rock faces because they blend in so well; it becomes a kind of camouflage.” She suggests looking for a tail flick or head turning side to side. “You can identify a mountain lion track because their claws retract so the paw print won’t leave claw marks the way a dog might.” Rush says it’s important to be mindful of dogs or any livestock, who should be put inside or sheltered at night if there are any mountain lions in the area. It’s also a good idea to remember there are safety in numbers; you’re always going to be better off in a group than you are alone. “It’s important to report any lion sightings to Colorado Parks and Wildlife so they can post warnings in the area,” Rush says. For more information, or to schedule a guided walk with a Yampatika Naturalist, visit www.yampatika.org.